Detection of different subpopulations (like Th0 cells, Th1 cells and Th2 cells). 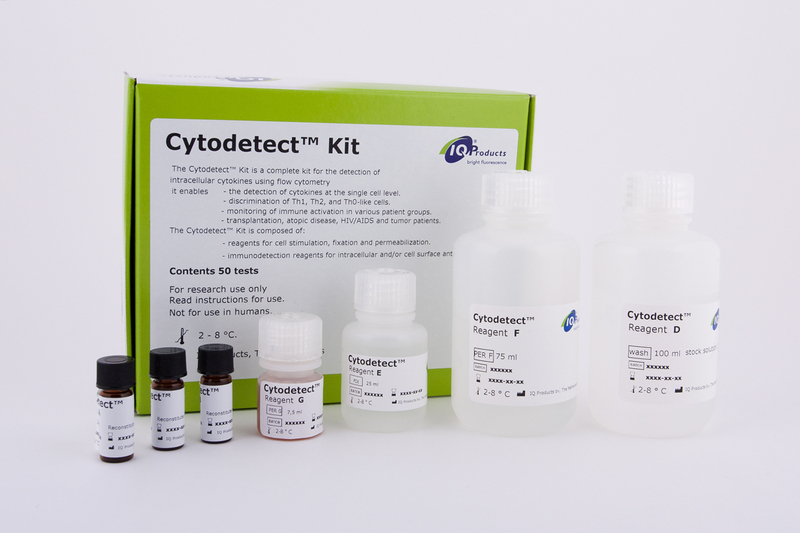 The Cytodetect™ Kit is intended for stimulation of leukocytes prior to analysis of intracellular antigens like cytokines and immunophenotyping of corresponding cells. Detection is performed using monoclonal antibodies selected for specific reactivity towards these antigens. Monoclonal antibodies are fluorochrome-conjugated for easier, direct application in flow cytometry analysis. This procedure allows detection of different subpopulations of lymphocytes or leukocytes based on both immunophenotype and functional activity with respect to intracellular production of specific cytokines. Possibly, discrimination of different types of leukocytes based on their cytokine profile allows assignment of functional activity, as has been suggested for Th1 and Th2 cells. Distinction may be helpful in determination of immunological presentation of activated cells in disease-related immunomonitoring. The level of most of the cytokines produced by immune unstimulated cells is to low to be detected by flow cytometry analysis. Therefore, a method has been developed to analyze cells which have been stimulated before detection of these intracellularly expressed cytokines. The Cytodetect™ Kit provides reagents for cell stimulation, fixation and permeabilization, according to the sequential steps as listed below. Three procedures are provided, a General Test Procedure which can be followed for immunostaining of e.g. CD3-positive or CD8-positive cells, an Alternative Test Procedure developed for immunostaining of CD4-positive cells and a slightly modified General Test Procedure for detection of TGF-ß. The Alternative Test Procedure results in a better discrimination of CD4-positive from CD4-negative cells, and thereby facilitating gate setting for flow cytometry analysis. 1. Moore JS, Zaki MH. Clinical cytokine network cytometry. Clin Lab Med 2001 Dec; 21(4):795-809. 2. Santiago MA, Luca PM, Bertho AL, Azeredo-Coutinho RB, Coutinho SG. Detection of intracytoplasmic cytokines by flow cytometry. Mem Inst Oswaldo Cruz 2000 May-Jun; 95(3):401-2. 3. Haddad JJ. Cytokines and related receptor-mediated signaling pathways. Biochem Biophys Res Commun 2002 Oct 4; 297(4): 700-13. 4. Townsend MJ, McKenzie AN. Unravelling the net? Cytokines and diseases. J Cell Sci 2000 Oct; 113 (Pt 20): 3549-50. 5. Prussin C. Cytokine flow cytometry: understanding cytokine biology at the single-cell level. J Clin Immunol 1997 May; 17(3): 195-204. 6. Pala P, Hussell T, Openshaw PJ. Flow cytometric measurement of intracellular cytokines. J Immunol Methods 2000 Sep 21; 243(1-2): 107-24. 7. Pala P, Hussell T, Openshaw PJ. Flow cytometric measurement of intracellular cytokines. Immunol Methods 2000 Sep 21; 243(1-2): 107-24. 8. Romagnani S. T-cell subsets (Th1 versus Th2). Ann Allergy Asthma Immunol 2000 Jul; 85(1):9-18. 9. Del Prete G. The concept of type-1 and type-2 helper T cells and their cytokines in humans. Int Rev Immunol 1998; 16(3-4): 427-55. 10. Infante-Duarte C, Kamradt T. Th1/Th2 balance in infection. Springer Semin Immunopathol 1999; 21(3): 317-38. 11. Klein SA, Dobmeyer JM, Dobmeyer TS, Pape M, Ottmann OG, Helm EB, Hoelzer D, Rossol R. Demonstration of the Th1 to Th2 cytokine shift during the course of HIV-1 infection using cytoplasmic cytokine detection on single cell level by flow cytometry. AIDS 1997 Jul 15; 11(9): 1111-8. 12. Bleesing JJ, Fleisher TA. Cell function-based flow cytometry. Semin Hematol 2001 Apr; 38(2): 169-78. 13. Le Moine A, Goldman M, Abramowicz D. Multiple pathways to allograft rejection. Transplantation 2002 May 15; 73(9): 1373-8. 14. Zhai Y, Ghobrial RM, Busuttil RW, Kupiec-Weglinski JW. Th1 and Th2 cytokines in organ transplantation: paradigm lost? Crit Rev Immunol 1999; 19(2): 155-72. Immunol 1996 Jun; 110(2): 107-13. 17. Sousa AE, Chaves AF, Doroana M, Antunes F, Victorino RM. Kinetics of the changes of lymphocyte subsets defined by cytokine production at single cell level during highly active antiretroviral therapy for HIV-1 infection. J Immunol 1999 Mar 15; 162(6): 3718-26.
specific CD4(+) and CD8(+) T-cell responses: relationship to viral load in untreated HIV infection. J Virol 2001 Dec; 75(24): 11983-91.
by flow cytometry following in vitro activation of peripheral blood mononuclear cells. Cytometry 1999 Apr 1; 35(4): 318-2.